E LIVE IN a very remarkable age. But I propose that, when future generations look back upon the Modern age, what will be most remembered is not what we might think. It was in the Modern age that mankind first traveled to the moon. But that is not what makes us stand out. Every culture & every age before us has traveled farther than their predecessors and made discoveries of new lands. Think of Columbus sailing to America and the explorers who first traveled to the North Pole. Traveling to the moon was just the next step, which will some day be surpassed. In the Modern age, we have treatments & inoculations & even cures for many diseases. But that is not what makes us stand out, either. Every culture & every age before us has contributed knowledge to the field of medicine. Think of DaVinci’s studies in human anatomy and Fleming’s discovery of antibiotics. In the Modern age, we have computers with enormous amounts of memory and the power to communicate instantly. But even that is not what makes us stand out. Every culture & every age before us has developed new ways to catalog information and to communicate. Think of the great ancient library of Alexandria and the later inventions of the telegraph & telephone. When future generations look back upon our age, what I think will be most memorable is none of those things. The achievements of our digital age will not seem so exceptional as maybe we would like to think. What will stand out is this: the fact that the Modern age is the first age in all of history to have lost sight of why we are living. From the Garden of Eden to the Aztecs to the ancient Greeks to the Ming dynasty to the British Empire, every culture has recognized, in some fashion or another, that the goal of life on Earth is, ultimately, life in heaven. Until our own. Our culture has lost the sense that we are made for God and destined to be with Him forever in heaven. This is what makes our age unique, and it is no compliment. 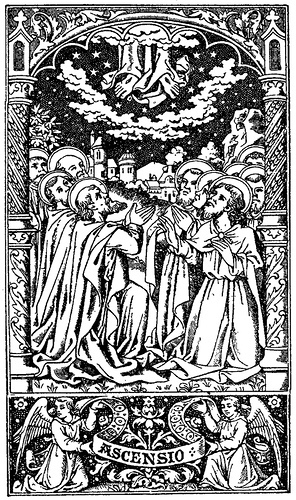 Yet this is the very meaning & significance of the Solemnity of the Ascension. Today, we celebrate the truth that we are not made for this Earth. Our bodies and souls are made for heaven, our true home. The Ascension is not some grand exit, whereby Jesus leaves us behind. Rather, He is showing us the way. We should hope, one day, to follow where Jesus Christ has led. So many people around us live as though comfort & pleasure on Earth are the greatest goods to be most highly prized, yet this life is but a prelude to the fullness of life in heaven. A great many people in our age have no desire to be shown the way to heaven. Do we?